Finding a lump, nodule, or throat cyst is generally enough to scare anyone but if you find a lump, before panicking, you should know a few things. Obviously, the first thing most people think of is cancer but in truth, most cysts are harmless. This sac of fluid can show up in any part of the body, even the throat. Remember, while a doctor should rule out any serious problem, most often there is no cause for concern since cysts rarely cause cancer or represent cancer. 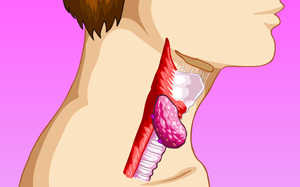 Typically, people become aware of having a throat cyst when they develop a sore throat. At that time, the individual might poke around and notice a lump or swelling. In addition, these lumps can also be associated with allergies. Depending on the cause and size of the cyst, your doctor may prescribe medication or simply leave it alone to see if it goes away on its own. Usually, the types of people that develop the problem of a throat cyst are those that use their voice heavily. This would include public speakers and vocal artists. As the vocal cords become strained, cysts or nodules grow. The best treatment option is rest, although many professional performers also use various forms of alternative remedies. Even sipping a cup of hot tea can do wonders. If you found a throat cyst, the last thing you need to do is worry but at the same time, you should have it checked in that there are cases when the problem is serious. As an example, cysts or polyps of the vocal cord could be the result of smoking. Usually, the person would lose his or her voice or the voice would become deep and raspy. Often, the best method of treatment is surgery in which the cyst would be removed, restoring the individual’s voice to normal while also opening up the airway, making it easier to breathe. A throat cyst of the vocal cord is one that doctors want to research further. When the vocal cord is traumatized, cysts can grow but this is extremely rare. If one were to develop, surgery would be the normal course of action required. Then, there is the laryngeal mucosal cyst, which occurs on the voice box, usually the epiglottis. The danger in this case is that if the nodule or cyst were to grow too large, the airway could be completely blocked. Therefore, surgery would be needed to remove the lump and open the airway. An interesting type of throat cyst is known as the esophageal duplication cyst, which is a unique congenital disorder that accounts for approximately 12% of all foregut cysts. This type of cyst would also need to be removed surgically but prognosis is great. Symptoms for this usually involve acute reflux, followed by a lump. Usually, the majority of these cysts are diagnosed in childhood so finding one in an adult is highly uncommon. Diagnosis and treatment have come a long way but new techniques are currently being developed. If you find a throat cyst, you would need to schedule an appointment with an ear, nose, and throat doctor. This professional is trained to handle all types of illnesses, traumas, growths, and other problems and would provide an accurate diagnosis and then make a recommendation for treatment. If you have never seen this type of specialist, you can talk to your primary care physician and ask for a referral.